If all the shooter titles I have played and reviewed on this site is any indication, I love me some bullet-hell shooters. Rarely do I not find one that I don’t appreciate for bringing something new and unique to the genre. The Nintendo Switch has blessed us with some of the best more often than not, but also some of the worst. Unfortunately, my time with developer Byte4Games title Mars: Chaos Menace is about the floor for what a shooter can deliver. Mars: Chaos Menace tasks you with taking out the enemy hordes that have invaded Mars while your team was terraforming the minerals from the planet. The story revolves around the humans having created technology so powerful that in order to save Earth from ecological disaster you must do whatever it takes to fend off the alien menace that’s trying to disrupt your plans. When you first start from a save file you are asked to pick from one of two heroes and the difference between the two are their shot types. Hero one has a relatively straight shot that’s more powerful, while hero two has a spread shot that’s a little weaker. There are three difficulties to choose from with Easy actually being hard and Hard being ludicrous. Finally, you’re taken to the stage select screen where you can only play the levels that you’ve unlocked. Other than the eight main stages are also extra levels and every level can be played again to try and get a higher score. Once a stage has been selected you’re ready to dive in and protect Mars from the invading alien force. A unique aspect of the gameplay for Mars: Chaos Menace is that you can shoot in front or behind you. Power-ups can be obtained to increase shot power or even call in drones that provide additional firepower. The blue powerups will make your main attack more powerful, whereas the green gives you a more powerful spread shot blast. There are other other weapons and abilities that can be used, including a plasma laser which has a meter on the right side of the screen to represent how much firepower you have left. The meter on the left is for your defensive shield and it can be put up to protect from enemy shots or kamikaze fighters. Each power operates on a relatively fast cool-down which can be used once the bar is fully replenished. When using the shield, it’s important to know when to use wisely as the more damage it takes, the longer it will take to recover. The hallmark of any shooting title comes down to its gameplay, and it’s here that Mars Chaos Menace suffers. Navigating your robot through bullets is an exercise in frustration with how slow you move and how lost in the gunfire you will become. The shooting never felt right with poor hit detection for certain enemies and the lack of different weapons was a disappointment. Using your plasma cannon or shield sometimes felt more detrimental than helping as it was hard to gauge when the shield would break and the plasma cannon would stop working way earlier than it should. As little fun as I had with the gameplay and shooting mechanics, the stages are beautifully designed and are vastly different from one another. The landscapes have a realistic quality to them, including oppressive deserts, to lush forests that you don’t often see in bullet-hell shooters like this. Unfortunately, with the more detailed backgrounds comes confusion in the form not being able to see exactly what’s going on. This is usually true with most bullet-hell titles, but Mars Chaos Menace took this to a whole new level of frustration. It didn’t help that I felt your robot was too big to effectively navigate through the shots, even though the hit-box was still on the smaller side. I’m used to a challenge with bullet-hell shooters, but Mars Chaos Menace managed to not only be unfair, but not fun at all. There is a lack of visual cues that contribute to many untimely deaths. Your recovery time-frame is severely limited from when you die at first to when you respawn, oftentimes causing another unnecessary death. Playing on Easy was the only way to give me a chance of actually completing the game, as you’re unable to continue at the point you die. You’ll have to start from the very beginning of a stage each time and this can really throw off the flow of the game. 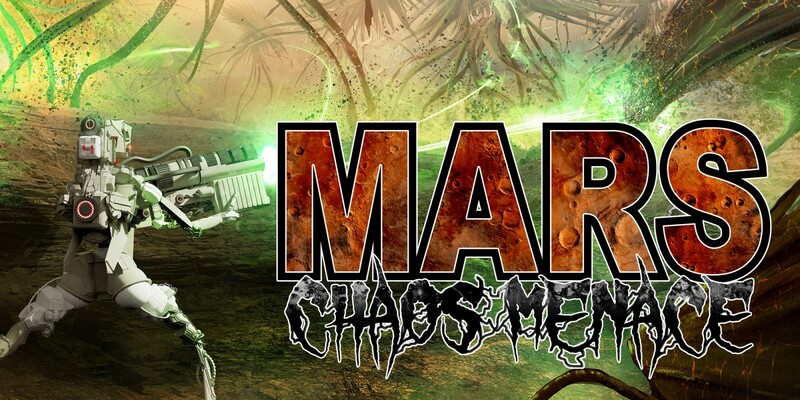 Overall, Mars: Chaos Menace is not the type of difficult shooter you want to recommend to any fan of the genre. The fun factor is almost non-existent and there was nothing intriguing about the gameplay or premise. Beautiful graphics can only go so far with a needlessly frustrating experience as Mars: Chaos Menace manages to convey.